The main "arbiter" for the discussion goes by the twitter handle @TheMagic_K , and at the beginning she seemed legitimately concerned. She took on the mantle of answering questions we were posing at Placebo. But she got frustrated. 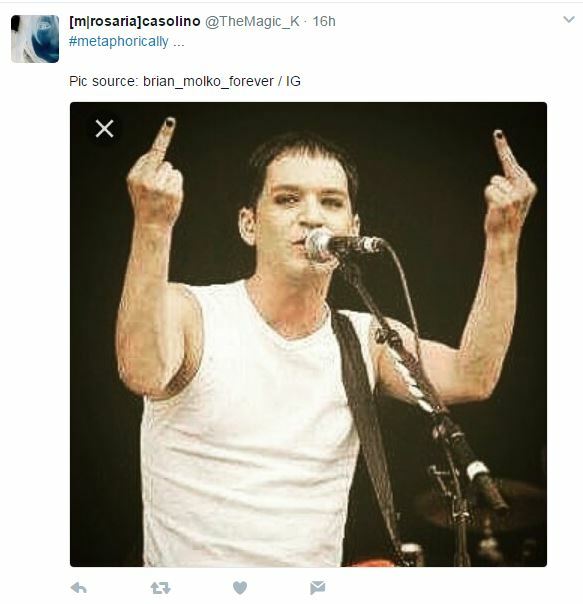 So far, PLACEBO and RISE RECORDS and Director Sasha Rainbow are letting their Twitter fans speak on their behalf. Those fans have turned to insulting me and using clever words like "Just Stop". Then one whom I had a long dialog with posted this image. Now I interpret this as directed at me, not at Awal... because it was followed by this post from the same person. That was in response to the qualifier that "Africa's largest e-waste dump" was a stand in for the "World's Largest E-Waste dump", a claim made repeatedly in UK press. Magic_K started looking for UNEP and other reports ... as if validating a claim about e-Waste dumping was "compensation" for Awal Basit, Kofi and Lamptea. I have to ask if I'm exploiting them, too. But I'm not earning anything off of this. I'm actually risking offending some pretty powerful people, and blog readers know the punishment Basel Action Network has tried to dish out on yours truly. So "poisoning the well" on WR3A Robin's tweets is the tactic the fans are pursuing. All fair enough in Twitter. But there are several other people in the discussion - people I don't know if I should name, given the (but search Placebo and Agbogbloshie on twitter) direction this is taking. The bottom line is that this barrage of tweets started with the questions why Awal, Kofi and Lamptea are not credited in the MTV video, and whether it's true they weren't compensated for what looks like some pretty harrowing fire and tire burning work. Brian Malko allegedly told Sasha Rainbow she had "balls of steel" just for pointing a camera at things like a tire full of burning gasoline... which Awal is literally holding over his head. So back to the desire for a professional quote, like the one up at top of this blog. Had something like that response been forthcoming, I might have told Awal to chill a little longer. Trying to intimidate the only guy speaking up for Awal and the other Agbogbloshie "crew" does not seem like the right move to me. The question was, is Placebo and its Twitter Army defending victims, or exploiting them? They've said to do some research. Fair enough. So on this invitation, lets do some more research on e-waste in Ghana as well as alleged "export crime". Both on the band videos statements about "supporting" scrap workers in Agbogbloshie, their "facts" at the end of the video telling us not to sell electronics to Africans, and at the end, what turns out to be a little bit of history about Placebo Band's track record using photos of children. These two questions overlap. 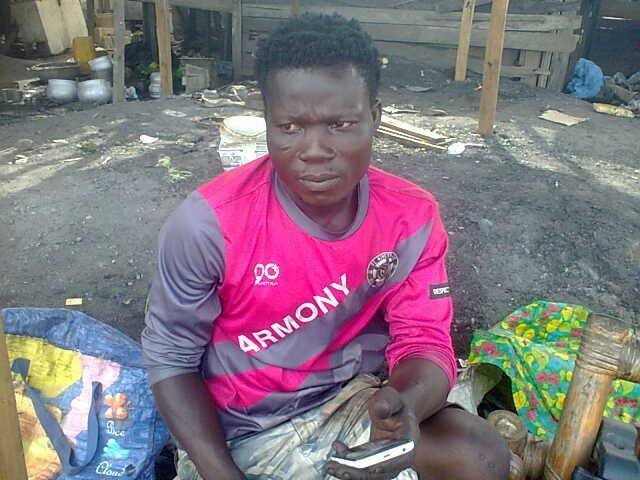 Is Awal a victim of foreign e-waste dumping? If that was a "fact" then arguably Placebo and Sasha Rainbow are "assisting him" with this video. There are a lot of really nice, well intentioned people out there (especially in the UK) who care about poor people like Awal Muhammed Basit living in polluted places. As they should, and as do I. But when the subject changes to exploitation of those poor people, we are seeing two different movies on the same screen. But hypothetically, if my facts about e-waste in Ghana were wrong, it has nothing to do with paying Awal. Here's the WR3A story about Africa e-Waste, in 3 bullets. The largest waste dumps in Africa are in the African cities with the highest rates of consumption. That's kind of a no-brainer. If a city is large, it's attracting a lot of people, and people are generally attracted by economies. If a city is relatively wealthy - like Accra, Ghana is among African cities - you expect to find more upgraded and replaced consumer products in its landfill. The largest X dump in Africa (cars, e-waste, clothing) are in the largest economies in Africa. And in that way, surprise, Africa is like Europe and America and Japan etc. Junk in a junkyard is associated with consumer behavior. There is no 500 sea containers of e-waste per month in Agbogbloshie. The source of that statement abandoned it long ago. Secondhand goods are better when you buy them from a richer neighborhood. This, too, is a no-brainer. Salvation Army, Goodwill, St. Vincent de Paul, and your local used car dealer all figured that out a long long time ago. So, if you are an African college student, where do you get a second-hand cell phone, display, or computer? If you said "I would look for it in a slum" you would be wrong. You would find it imported from a wealthy city. Most consumption in wealthy places is triggered by "elective upgrade". If you are from a rich country, you are more likely to already own a mobile phone or laptop or car. And you are most likely to replace it - why? If you answered "because it was broken and I tried three repair shops who said it couldn't be repaired", you are a very rare bird. Most people replace something because they buy a better one, or are given something better as a gift. As wages increase in emerging markets, that's more true as well. So you find more consumption of used cars, computers, and cell phones in Africa than you find on 5th Avenue in New York City. And you find more "elective upgrade" happening in high consumption wealthy places. And you will find more skilled repair people in less wealthy, "good enough" markets. HERE IS DATA ON TELEVISIONS PER HOUSEHOLD IN EVERY COUNTRY. LOOK FOR NIGERIA, EGYPT, AND GHANA ON THE LIST, THE NUMBER OF TVS IN THEIR CITIES 20 YEARS AGO. So here is another quiz. When someone looks for the biggest dumps in Africa, they will find them where (a or b)? b) In the poorest, lowest consuming cities in Africa. If you answered "a" good for you. So about ten years ago, someone said "80%-90% of the things poor people in upwardly mobile countries buy can't be repaired and is pawed apart for scrap." That source generated hundreds of citations, including @Independent, @Guardian, @TheEconomist, @BBCPanorama, and in the sentencing recommendations for Joseph "Hurricane" Benson of BJ Electronics - another African who got screwed by White Privilege. Memorial University has used a computer program to trace the references, showing how they show up in various media. So this is what Placebo Twitter bulldog calls my "bullsh**". The logic above is so evidently preposterous to her that Awal can eat cake. Sorry, that's a snarky reference to white privilege, if you heard a whoosh. Placebo must be hoping this is a clash of Zealot Partisans they can stay clear of. So my guess is that PLACEBO and RISE RECORDS know where this is going next. Look, I'm not necessarily the middleman for Awal. I'm not making a dime on this. It's distracting me from my work. I'm not here to make trouble for Brian Malko or Stefan Olsdal. If they want to "research" the claims their video makes about Data and Science and e-waste dumping in Agbogbloshie, here's a native Ghanaian, Grace Akese, who is doing a dissertation on the matter at Memorial University. There's also her faculty advisor, Dr. Josh Lepawsky. Oh, and here's a set of references to the pollution in Agbogbloshie before e-waste was a "thing" (1970s, 80s, 90s). Hint, it's not about you. And here's a tweet from a representative of Europe's GREEN PARTY, who personally lived at Agbogbloshie for two months. What I was trying to offer Placebo and its reps is a way to deliver a quote, like the one at the top of this blog, which would demonstrate they actually care about Awal Basit Muhammed. If they think that insulting Robin on twitter, giving me the middle finger, is the way to handle this, then perhaps they should do some research on me. Generally I give people courtesy for several days before I go all caps. But if they won't answer Awal's questions, through Grace or Rafa or Wahab or Alhassan Ibn Abdullah or one of the dozens of people who know what's going on there, I'm not going to stand down. I could write as much about this as I have #freejoebenson and #lordchrissmith. So they can talk to Awal directly if they have his check. Not as if this is the first time for Placebo.